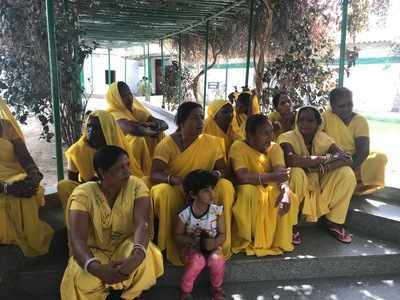 Every morning these women stepped out of their homes not to go worship in the temple, but to flush out excreta from the latrines of people living in their own village. They were manual scavengers, the emblems of tragic fallout of India’s long-standing caste-based society. “I was just seven when I started going out with my mother to learn the job, since it was expected from me,” says Usha Chaumar, one such manual scavenger from Alwar, Rajasthan. Manual scavenging, the act of cleaning human excrement from dry latrines, has always been executed by the ‘untouchables’. In addition, it is mostly women who are forced to carry out such abominable task. Women in families like Usha’s have been working as manual scavengers from generations. By the virtue of widespread discrimination against people of their caste, they were never able to raise themselves out of their dark and unrewarding profession.“Our mothers would tell us that we had no other option but to continue working as manual scavengers. Even if we tried to sell vegetables or stitch clothes, nobody would buy them since we were considered to be “untouchables,” recalls Usha. Marriage also, did not come as a respite for these women. These ladies got married to men of the same caste which resulted in both of them continuing to do similar work. Does manual scavenging still prevail ? Manual scavenging, apart from being an unpleasant task is also unsafe for the people doing it. Usha recalls how one of her companions had lost her eyesight after the acid they would use to clean the latrines went in her eyes. “We would suffer constant headaches and spells of vomiting. The doctors never told us that our work was the reason for our ill health,” she says. This remains an everyday reality for such women despite the fact that Government of India had passed a law making employment of manual scavengers a punishable offence. The first of these laws was passed in 1993 and then amended in 2013. Regardless of the law, practises like these run rampant and unchecked until today. Thousands of women all across the country are still subjected to disgrace and humiliation by being forced to become manual scavengers. However, the circumstances are not as dismal as they may seem. Usha and others like her in Alwar today say that they used to do so because were successful in lighting their lives out from the darkness of this contemptible practice. Sulabh International, a social service organisation working to promote sanitation and make India clean and open defecation free helped such people in coming out of their living nightmare. This organisation was able to eradicate the practice of manual scavenging in their villages completely. Sulabh International aided them by ensuring the construction of toilets in every home, school and college in their villages. Along with that, the organisation worked extensively for the rehabilitation of these women scavengers. ‘Nai Disha’, a centre started by Sulabh International in Alwar, provides women who have given up manual scavenging with vocational training which has helped them rebuild and transform their lives. “We now work as beauticians, seamstresses and make edibles - pickles and papads (a thin crisp cake made of seasoned black gram flour) all of which are bought by the same people in whose homes we used to work as scavengers,” says Usha Chaumar, who is now the President of Sulabh International. She and her companions are now working towards educating and rehabilitating other women scavengers. How Technology rescues manual scavengers? Technology has also proved to be a saviour for scavengers, especially in Kerala. A group of engineers from Kerala assembled a robot that could clean manholes and drains with ease and named in Bandicoot. A report by The Hindu titled ‘Bandicoot to the rescue’ dated February 27, 2018, on the official launch of the robot by the state government. Initiatives like Bandicoot and that taken by Sulabh International give the thousands of existing manual scavengers in the country the hope of freedom from poverty and destitution. It promises them a way to a better and respectful life.